We are only 5 minutes drive from Dundee, the fourth largest city in Scotland and allegedly Scotland’s sunniest city. It has an interesting history and is famous for the three Js, Jam, Jute and Journalism. At present Dundee is undergoing a huge transformation with the opening of the V&A in Sept 2018 and the development of the waterfront. It is worth taking a stroll along the waterfront to see the transformation or how about walking the Tay Road bridge. There are many good places to eat and boutiques and new shops are popping up in the city. There is much to see and do. 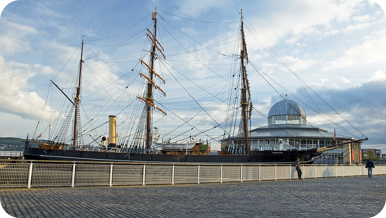 The RRS Discovery, the Ship that transported Scott and Shackleton to the Antarctic is definitely worth visiting. Other popular attractions are Sensations science centre, Verdant Works, McManus galleries. Take a look around the Dundee Botanic Gardens or head up to Dundee Law for fabulous views of the city or take a walk through the Riverside Nature reserve and enjoy the views and Highland cattle grazing nearby. Camperdown Country park and Wildlife Centre, only a few miles from the Farmhouse is also popular with families. We are about 20 minutes drive from Perth where you will find a good selection of shops and cafes. There are good walks by the River and around and between the North and South Inches or how about a visit to The Black Watch Castle, Museum and café or a visit the Perth Museum and Art Gallery. 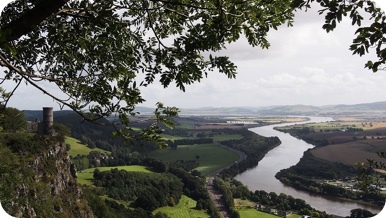 For spectacular views and nature spotting, a walk up Kinnoull Hill through the woodlands is well worth the effort! If you are at Perth and fancy a drive into the countryside, Gloagburn Farm Shop is worth a special visit. It is not far from Perth and has delicious food, a fantastic farm shop, great range of Scottish gifts and a small play area for kids. I am a Fifer and was born just outside St Andrews and so would always recommend it for a day trip! It is only a 30 minute drive and and it really is worth spending a day here. 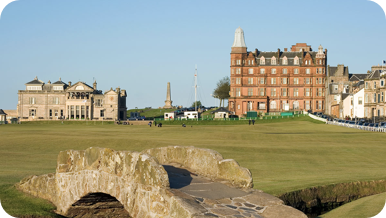 Famous for being the Home of Golf, for having a very good University, founded in 1413, the first in Scotland and of course that fantastic beach filmed in Chariots of Fire, The West Sands. It’s a great town to have a stroll through with many decent shops and places to eat. Visit the very popular Janettas or Luvians for an ice cream and head for a walk along the beautiful West Sands beach, visit the British Golf Museum, the Botanics or St Andrews Cathedral and climb St Rules Tower for great views or head to St Andrews Castle with its underground mine and the Bottle Dungeon. Craigtoun Park on the outskirts of St Andrews is popular with families and there is plenty to do. If you enjoy history, Glamis Castle, Scone palace, and Falkland Palace, Fife are all within 30 minutes drive and are all worth visiting. Scone Palace at Perth, where Scottish Kings were crowned, fabulous grounds to explore, lots of events ie falconry displays and medieval battle events! Glamis Castle – Enjoy a guided tour of the childhood home of The Queen Mother. There is plenty going on and beautiful grounds to explore. Falkland Palace and Gardens – If you are a fan of Outlander, you might enjoy a visit to Falkland where some of the series was filmed. You could combine a visit to The Palace and gardens with a walk up the Lomonds and afternoon tea in the village. We recommend The Hayloft tearoom. The Scottish Antique Centre at Abernyte and the Rait Antique Centre are both close by and well worth a visit if you enjoy antiques. The Scottish Antique Centre has a huge amount of antiques and new furniture, soft furnishings, gifts and food and a good restaurant and Rait has a lovely tearoom, the Tufted Duck. Only a few miles from Dundee and has a good selection of places to eat and shop. Stop at the popular Visocchis for pizza and ice cream and head to Broughty Ferry beach and Broughty Castle which was built in the 15th century. You can book a boat tour with Pirate Boats and go dolphin watching on the Tay. They have some fantastic footage of dolphins leaping alongside their boat. For afternoon tea, Jessie’s Kitchen is popular with locals and visitors. Fancy visiting a distillery or winery? – Cairn O’Mohr is a local winery producing fruit wines and cider. There is a cafe and an orchard walk. Also of interest and not too far away Lindores Abbey and distillery (book afternoon tea), Edenmill on the way to St Andrews (whisky, gin and beer tours) and The Famous Grouse experience (whisky tours, shop and dining) at Crieff and Kingsbarns Distillery (Tours, shop and café) over in Fife. The Kingsbarns Distillery is a bit further away, about 15 minutes from St Andrews on the Crail Coast Road but it is well worth a visit and could be combined with a beach trip to the beautiful Kingsbarns beach, one of the best in the East Neuk. Dunfermline Heritage Quarter is a bit further afield and takes about 45 minutes by car but would make a good day trip to visit the Dunfermline Abbey, Church and Palace. The Abbey Church houses the tomb of Robert the Bruce and the Abbey is the burial place for Scottish Kings and Queens. If you are there with kids, a visit to Pittencrieff Park would be enjoyed by all. After sightseeing we enjoyed a family meal at Fire Station Creative, a disused fire station converted into a café and gallery. 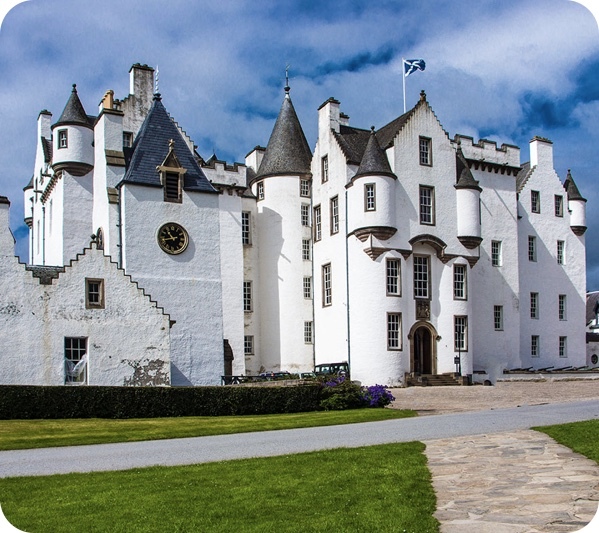 Even further afield the wonderful Blair Castle is 35 miles North of Perth and a tour of the Castle and estate would make a good day trip. Their website says you can tour the Estate on a Highland pony! It could be combined with a stop at House of Bruar and a walk up to the Falls of Bruar. Edinburgh – Edinburgh, Scotland’s capital city, takes about an hour by car. This beautiful city makes a fantastic day trip with so much to see and do.